What Will A World of 3D CAD Printing Bring? As someone involved in educational technology, who writes about disruptive technologies in schools and society, there was something fascinating about my trip to the dentist today..
Less than two hours start to finish I received a new crown, as new technologies turn an old 2 WEEK process into a routine office visit. Amazing. They used a special camera/measuring tool to image the teeth–a small wand that clicked with an image of each tooth surface. Afterward, the computer displayed a three-dimensional build of the area that looked like a detailed topographic map. The dentist then rotated the image to inspect all the adjoining surfaces, then aligned the top and bottom teeth which included the new, virtual crown. The technician (thank you Carol) outlined the area for the new crown on the computer much like one would use the lasso tool on Photoshop, before using a blur-like tool to remove high spots that were clearly, brightly colored on the computer image of my new crown. Eight minutes later the tooth was made. Next, it was hardened and baked white in a small kiln at nearly 900 degrees. After it cooled, sealers were applied before being cemented into place. 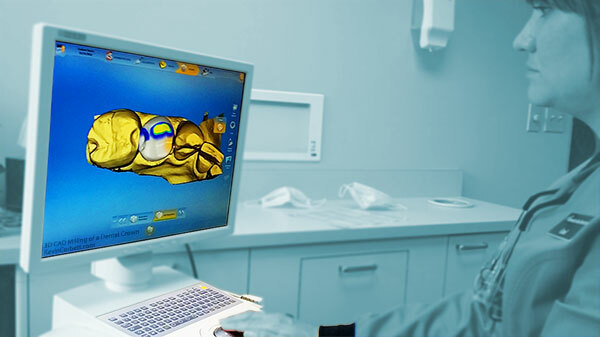 Dr. Marxen feels really good about the exacting nature of the technology which creates 3D manipulable images that easily allow him to see the fit around all surfaces and match in biting surfaces, prior to “printing” the crown to his Sirona Cerec 3D milling machine. He likes the ability to maximize the time in one appointment to minimize invasiveness, reduce repeated trauma in the area of the jaw, and the safety in securing a crown immediately for protecting the affected area. Consider the power and capabilities of 3D printing & milling as CAD capabilities become more cost-effective and extend to other industries & institutions. How will this technology change our world? Motley Fool investment group hails 3D printing as the next Industrial Revolution, making production factories in China obsolete–the next trillion dollar industry. What will students of the (very near) future need to learn? What kinds of skills and trainings will future workers people need to have to be successful in their chosen careers? Dr. Marxen didn’t expect to be a CAD programmer and now this technology has increased the effectiveness and efficiency of his practice. How will values be shaped when you can create anything you’re able to conceive? And alas, how will we deal with the many lawsuits/patents/hacks that will occur as the ability to imitate and own items we ‘manufacture’ at home? NOTE: The video was taken from my cell phone (Note 3) during my visit (that’s my crown in the machine!) and edited using AndroVid Pro while sitting in the dentist chair–prior to uploading to YouTube (which took longer than finalizing and securing the crown).